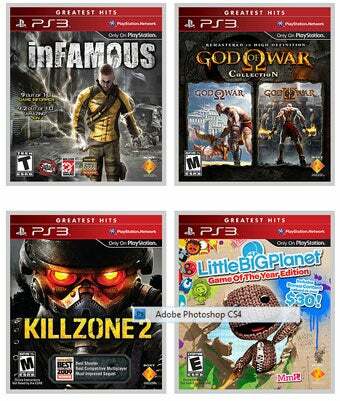 Confirming last night's Walmart ad, Sony has announced ten new titles joining the PlayStation 3's budget-priced Greatest Hits line, with inFAMOUS, God of War Collection, Killzone 2 and Resident Evil 5 and more now available for $29.99. While the Walmart ad we linked to last night contained several new Greatest Hits entries, including Resistance 2, Killzone 2, UFC 2009 Undisputed, inFAMOUS, and the LittleBigPlanet Game of the Year Edition, it only covered half of the games Sony adds to the Greatest Hits library today. Those five titles are joined by the God of War Collection, Dead Space, Fight Night Round 4, Resident Evil 5, and Soulcalibur IV, for a grand total of ten new titles at silly prices. These latest additions bring the Greatest Hits grand total to nearly 40 titles. If that's not a strong argument for hopping on the PS3 bandwagon, I don't know what is.